What are the critical principles underpinning great art? alluding to subject material outside of the field of view (to conceptually expand the range of projected meanings beyond the featured subject material). 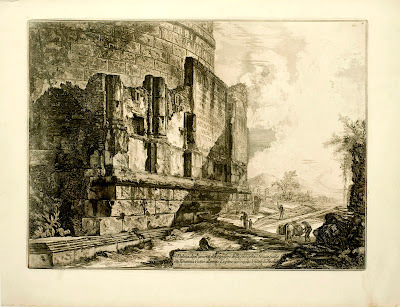 In the following discussion I will address each of these principles and explain how Hendrick Goltzius and Giovanni Battista Piranesi have applied them. 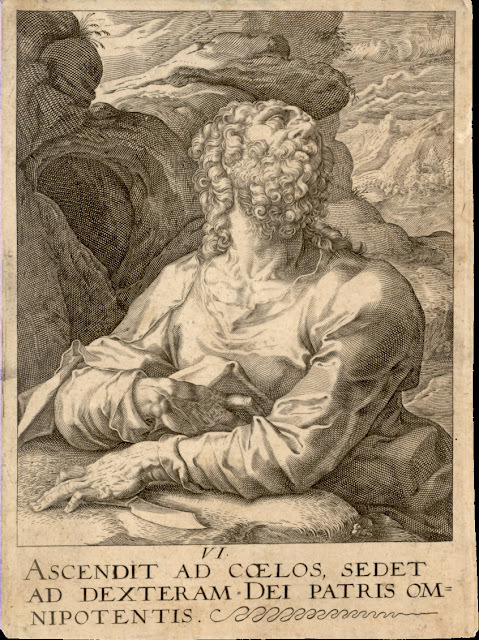 My choice to use Hendrick Goltzius’ Apostle Simon (shown below) as an example of the first principle—projection—is simple; I love the print. Moreover, I find myself drawn to keep looking at it. For me, the attraction has nothing to do with the physical beauty of the subject as I am sure that there are few viewers who would see Saint Simon as eye candy. 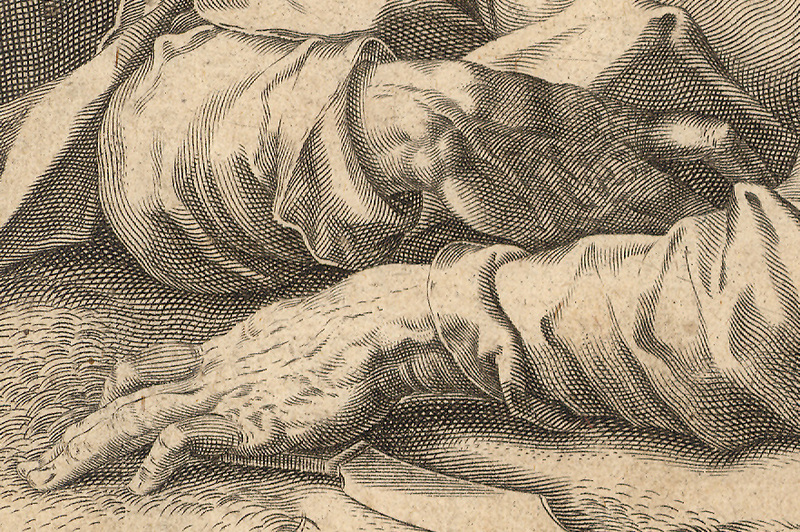 I am, nevertheless, attracted by the finely engraved lines rendering the image (see details further below) but this is only a small part of the reason I love the print. The primary attraction lies with Saint Simon’s hands. This is especially true with regard to the saint’s left hand and more specifically with his third finger so emphatically pressing on the ground as if the saint is making a ideological point. This arrangement of the forward projected finger is the element that both arrests my eye and draws me into the image. After this pictorial “introduction” into the image my eye then follows a gently spiralling course. First stop is the saint’s left hand. Next, my eye moves to traverse across the book (bible?) the saint is holding to arrive at his right hand. 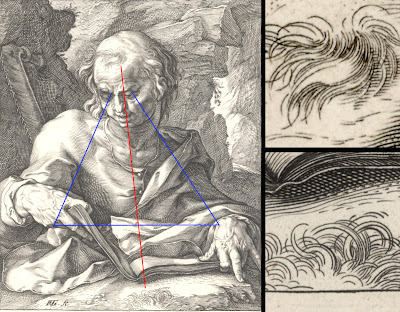 After pondering the odd way that Saint Simon holds the book—mindful that the saint’s hands is undoubtedly modelled on Goltziius’ own deformed right hand (see drawing in Teylers Museum Haarlem)—my eye is then lead along his right arm to finally “rest” on his face (see diagram of the rhythm below) before making visual forays to examine other pictorial features like the saw of his martyrdom. I am selling this print for $560 AUD including postage and handling to anywhere in the world. Please contact me using the email link at the top of the page if you have any queries or click the “Buy Now” button below. Although the middle-finger of Saint Simon’s left hand is the point of introduction into the image, there are other elements in the print contributing to an invitation to look. For example the spine of the open book also draws attention inward as do the converging lines of the saint’s arms. To make the point of this discussion clearer in terms of how the eye is invited to engage with the act of looking and thinking, compare the difference in how the eye is not so welcomed by the arrangement of hands and arms in Golzius’ Apostle Bartholomew. 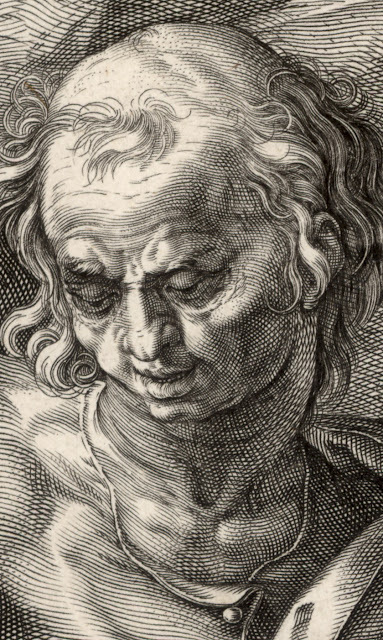 This is true even though there are many other pictorial devices inviting the viewer’s eye to gaze into the print’s pictorial depth, such as the flaying knife of the saint’s martyrdom and the saint’s backward tilt of his head. I am selling this print for $360 AUD including postage and handling to anywhere in the world. Please contact me using the email link at the top of the page if you have any queries or click the “Buy Now” button below. 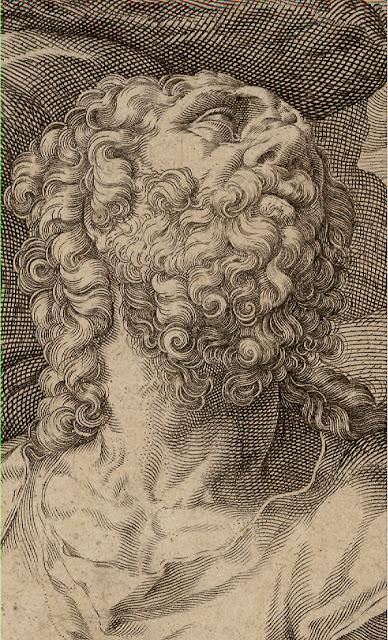 Regarding the second principle—visual dialogue—I will return to Goltizius’ Apostle Simon as this print is so cleverly composed and rich in subtle use of visual devices. To begin at a very fundamental level, even the most cursory look at the image will show a connection between the saint and his book. This relationship between the centre-of-interest—the saint’s head—and the book he is examining is a fine example of visual dialogue. On a more reflective examination of the image, however, there is more to this visual dialogue than just the saint reading his book. He is also responding to what he is reading and this is signified by the gesture of the middle-finger of his left hand. 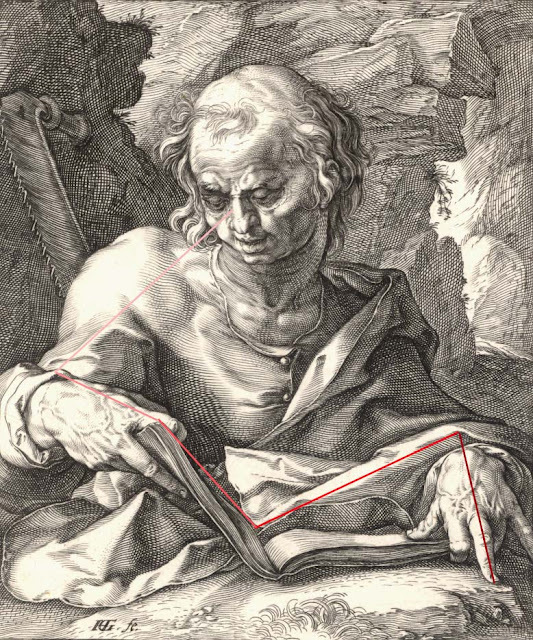 This hand gesture that I proposed earlier as Saint Simon making an “ideological point” (i.e. 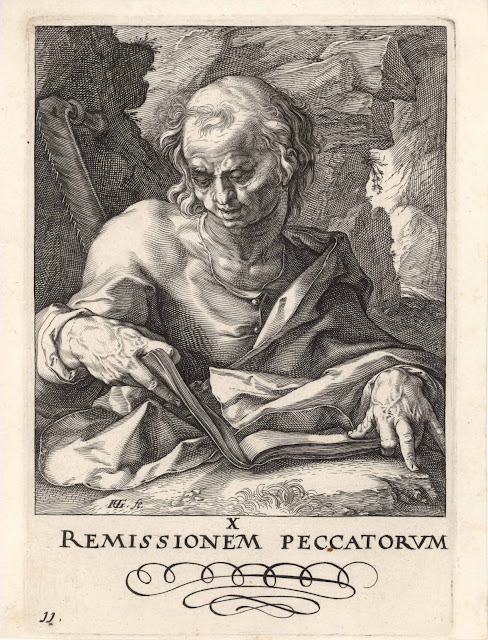 a body-language gesture of clear emphatic certainty) does more than depict Saint Simon fully engaged in his reading. This gesture is the punctum point (discussed in an earlier post focused on Dujardin and Dietricy) of the whole image. 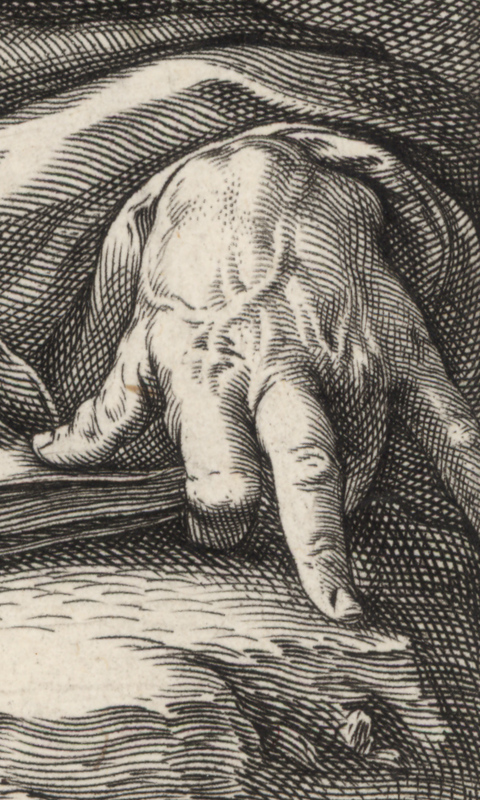 In short, this single finger is the pivotal feature in the composition that shows the intensity of the saint’s reading of the book. Even more subtle than the triangulation between the saint’s head, book and finger is the visual dialogue between the saint’s central lock of hair and the tuff or grass in the centre foreground (see diagram below). 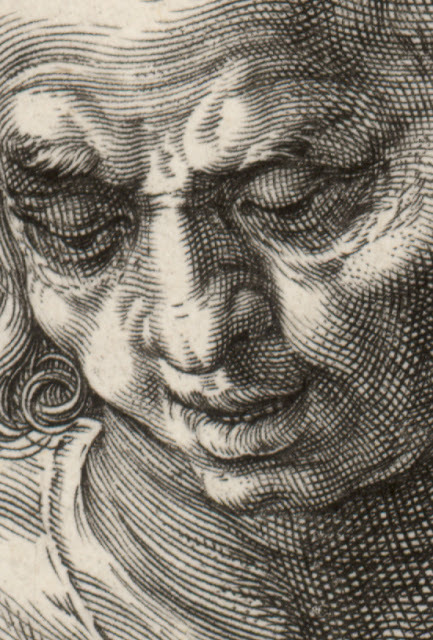 To my eyes, this visual connection created by the similarity of form between the hair and grass is important to the expression of a decisive moment in the saint’s reading. From my viewpoint, I see the link as establishing a line of separation between the related dual gestures of the saint’s hands. 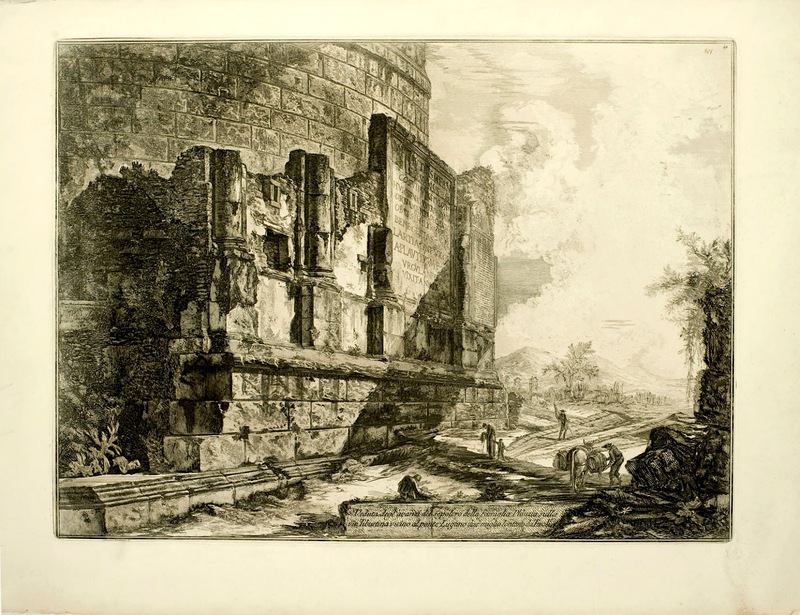 For the final principle—alluding to a subject outside of the field of view— Piranesi’s etching, The Tomb of the Plautii near Ponte Lucano (shown below) is an excellent example. Here the shadow cast by an unseen structure lying beyond what can be viewed in the image creates a theatrical dimension of an unknown presence. This shadow not only hints at the form of the structure casting it but the shadow’s shape—especially the “extension” of the shadow’s shape into the cloud pattern—creates a window-like effect by framing the far distance. This principle is a very useful device for giving an artwork pictorial breadth). To illustrate what the print would be like without the shadow, compare the original etching with a view of the same tomb without a shadow (see the digitally manipulated image below). Beyond the use of shadows, another way to connote subject material beyond what is visible is the simple device of cropping the portrayed subject at the framing edge of the artwork. Again, Piranesi’s print is a good example of this approach as the portrayed tomb is not a panoramic view where the whole building can be seen but is cropped by the left and top edges of the format. This cropping ensures that a viewer understands that the image is only a section of a much broader view and this projects the notion and feeling of breadth. I am selling this print for $960 AUD including postage and handling to anywhere in the world. Please contact me using the email link at the top of the page if you have any queries or click the “Buy Now” button below.